I recently returned from Peru where I spent some much needed time watching and photographing Kelp Gulls. I spent most of my time working several beaches and coastal lagoons around Lima (-12S, 77W). The subspecies of Kelp found in Lima is nominate L.d. domincanus - incidentally, this population is the northernmost stronghold for the species in South America. 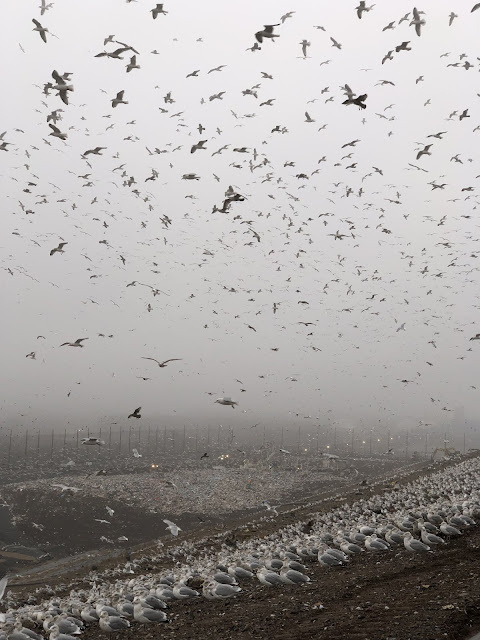 The Kelp Gulls can be rather accomondating in relatively large numbers here, often seen with Belcher's and Gray-hooded Gull, along with Franklin's Gulls and the occasional Gray and Andean Gull. As noted in Part 1 of this two-part series, there is a dearth of information on Kelps in the north of South America. Perhaps not surprising, there is little data on molt timings or molt strategies for populations in Peru. Howell & Dunn (2007) give molt descriptions for southern South America, while Olsen & Larsson (2004) simply assert that northern birds molt "later" than southern conspecifics. With this being the austral spring, I was expecting to find the majority of 1st cycles with juvenile flight feathers intact, or at the most, a few advanced individuals commencing inner primary molt. Instead, I discovered a radically different flight feather molt sequence - one that, to my knowledge, has not been documented for this species. Below, I present a series of images illustrating a molt sequence not previously described in Larus dominicanus. A rough estimate of the percentage of individuals with similar molt patterns (n=375) is provided where necessary. A: Hatch Year (HY) Kelp Gull with all renewed, 2nd generation, rectrices and secondaries. All juvenile primaries retained. Flight feather molt apparently suspended at s1/p1. Approximately 35% of this age cohort showed a similar molt sequence. Chorrillos, Peru. 03 November 2018. B: Renewed tail feathers and more than half of secondaries already 2nd generation. Secondary molt in motion. All juvenile primaries. Approximately 15% of birds showed a similar sequence with some scaling back to a less advanced pattern to the outer secondaries (see next example). Miraflores, Peru. 01 November 2018. C: Similar to individual above, but note the outermost secondaries now take on more of a regressive, 1st generation apperance. This was noted in roughly 5% of individuals. Miraflores, Peru. 01 November 2018. D: This individual has roughly half of its secondaries renewed, but with no apparent active molt or molt gaps. Tail feathers 2nd generation. Seen in about 25% of individuals. Chorrillos, Peru. 02 November 2018. E: Similar to the bird above, tail feathers 2nd generation (except for r5 on right). Tertials renewed as are a few adjacent, inner secondaries. All juvenile primaries. Chorrillos, Peru. 03 November 2018. F: Again, tertials renewed as are a few inner secondaries. Ony two 2nd generation rectrices. Juvenile primaries and outer wing coverts. Miraflores, Peru. 01 November 2018. 1) Are the 2nd generation secondaries and rectrices a result of an extensive 1st prealternate molt? 2) Are they the first flight feathers to be replaced in the 2nd prebasic molt, preceding molt of primaries? 3) With the highly variable mixture of retarded upperwing coverts and scapulars, versus those that are rather advanced and adult-like, is it possible some hatch year Kelp Gulls have a preformative molt soon after hatching, followed by an extensive prealternate molt late in the austral winter/early spring? 4) The advanced, adult-like, aspect to the renewed secondaries is puzzling. Is it possible these individuals become adult-like via 3 molt cycles? Perhaps the explanation isn't an easy or straightforward one. In those individuals undergoing active molt in the remiges, roughly 1/4 showed some primary molt. This is where matters become much more interesting and perplexing. G: The outermost secondary is retained juvenile, with p1-p2 dropped. Rectrices 2nd generation. Found in approximately 10% of individuals. With such an advanced aspect to the scapulars, tail and secondaries, is it possible this is a 2nd cycle with 1st generation primaries never molted in the first prebasic molt? Chorrillos, Peru. 03 November 2018. 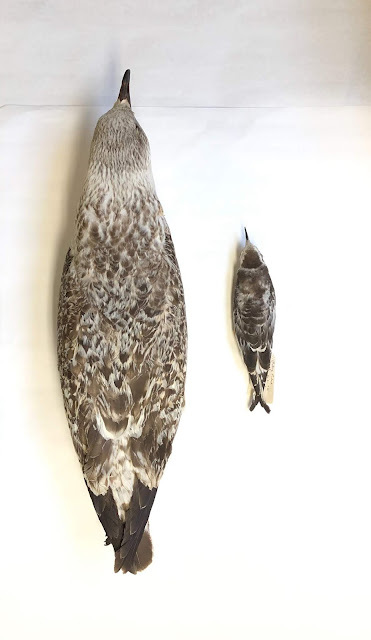 H: More similar to the molt sequence of a large gull from the northern hemisphere, this individual has renewed p1-p2, but has also replaced tertials and 2-5 adjacent secondaries. This molt pattern was the exception rather than the rule and only observed in a handful of birds (less than 1%). Miraflores, Peru. 01 November 2018. 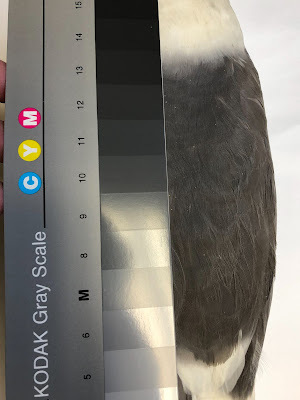 I: Another bird "seemingly" coming close to the flight feather molt pattern of a northern gull, although the assumption here is that molt began with the innermost secondaries and worked its way out, distally. In reality, this sequence isn't very similar to a northern gull's flight feather molt pattern. All tail feathers 2nd generation. Note the contrast between s1 and p1, suggesting some time lapse. Found in less than 5% of all individuals. Chorrillos, Peru. 02 November 2018. J: All 2nd generation secondaries and rectrices. Outer primaries renewed (p5 dropped, p6-p10 2nd generation on right wing; p8-p10 2nd generation on left wing). This sequence appears to be eccentric! Found in roughly 5% of all individuals. Chorrillos, Peru. 02 November 2018. K: Similar to "J" above, but only primary molting is p9 with all others juvenile. Chorrillos, Peru. 03 November 2018. L: A most unusual case. P1-P3 juvenile, new p4 tip emerging past primary coverts, p5 dropped, p6-p8 renewed 2nd generation. P9-P10 retained juvenile (symmetric). Secondaries renewed. Chorrillos, Peru. 02 November 2018. L2: Same individual above. Note the innermost primaries have been dropped on the right wing. L3: Same individual above. The tail feathers are 2nd generation, corresponding with the same molt which produced the 2nd generation secondaries. The percentages given above are crude estimates based on my daily field notes and review of several thousand photographs. The values are percentages of birds in active molt, and don't account for the subgroup showing entirely juvenile remiges. These numbers are only meant to give an impression of how common (or uncommon) each molt pattern is in November for this particular population. Limited prealternate molt has produced mostly new 2nd generation scapulars, several proximal wing coverts and a few tertials (bold white edges). But also notice the replaced p9 on the left wing. Chorrillos, Peru. 02 November 2018. 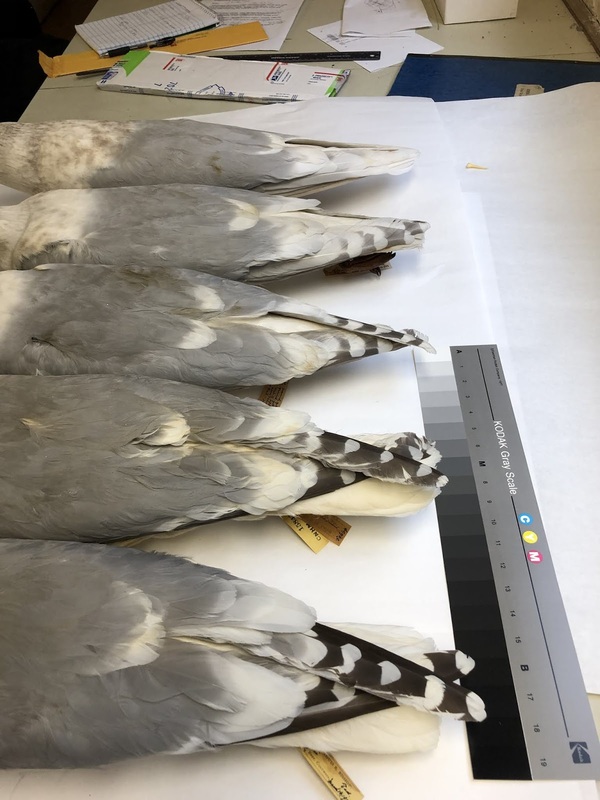 Needless to say, larger samples and more study is necessary in order to get a more accurate assessment of which molt is producing which feathers. 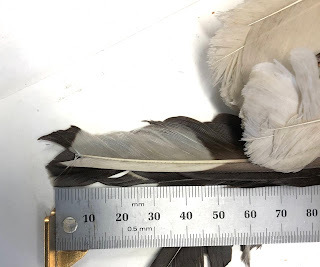 But if the 1st prealternate molt is said to include tertials, then naturally, the few inner secondaries replaced on birds such as D-F must only be an extension of this. Further, some advanced birds apparently go on and continue to replace all secondaries (such as A). The big wrench in this new data is where the primary molt fits in. Birds such as I-L need careful analysis. These molt sequences may vary from year to year depending on breeding success, food resources and competition. 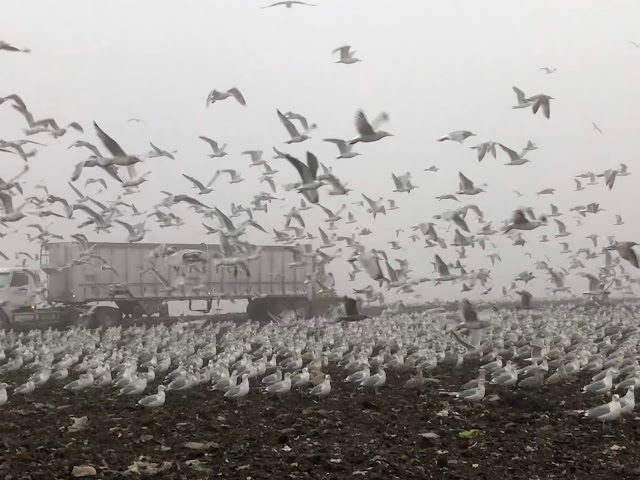 As this is a single point in time from the calender year, there's no telling if those with more extensive primary molt are individuals that have migrated from southern populations, or, are largely resident birds which are afforded a speedy and extensive molt due to the rich food source of the Humboldt Current. A question to ponder is if such birds - as adults - are confined to a 12 month breeding cycle. A population's breeding cycle is an integral component to understanding how that group regulates feather molt. My visit, being at the onset of the breeding season (November 1st), is a time when many adults are building, protecting and sitting on nests. From Yorio et al (2016), we can infer that young fledge from January through February in Peru. Thus, the youngest free-flying Kelp Gulls on display during my visit were approximately 8-10 months of age. A large number of individuals - from those with some degree of renewed secondaries - resembled the bird above. This is a striking appearance that would attract attention in a flock of gulls in North America or Europe. Chorrillos, Peru. 01 November 2018. Same individual above. We can be sure these young Kelp Gulls replace flight feathers beginning closest to the body and outward. Most interesting is the aspect of these new secondaries, appearing 3rd generation in nature. The uppertail coverts and central tail feathers are likely juvenile (?). Do other populations of Kelp Gull share similar molt sequences in southern South America (or anywhere else)? If not, then what taxonomic implications might this present? 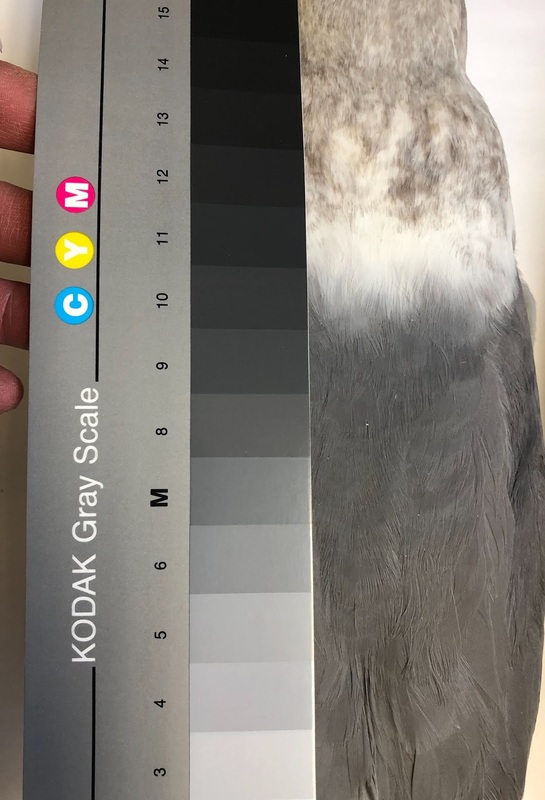 Finally, if an individual such as the bird above was to stray to North America in the boreal winter season, the flight feather molt pattern should be useful in establishing a good Kelp Gull candidate. Certainly any young black-backed gull found with such a pattern out of season would send off red flags to the discerning eye. 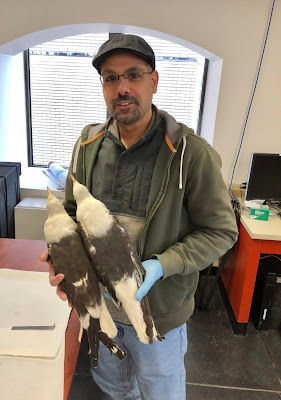 With the paucity of records of 1st and 2nd cycle Kelps in North America, perhaps this note will give observers one more incentive to investigate feather molt of their local gull flocks. Howell, S.N.G., and J. Dunn. 2007. A Reference Guide to Gulls of the Americas. Peterson reference Guide Series. Boston. Houghton Mifflin. Olsen, K.M., and H. Larsson. 2003. Gulls of Europe, Asia and North America. London: Christopher Helm. Pyle, P. 2008. Identification Guide to North American Birds, Part 2. Slate Creek Press, Bolinas, CA. Yorio, P. 2016. Distribution and Trends in Kelp Gull (Larus dominicanus) Coastal Breeding Populations in South America. Waterbirds 39: 114-135.